KDA Feat. 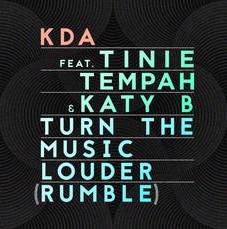 Tinie Tempah & Katy B ‘Turn The Music Louder (Rumble)’ is possibly set to be the big autumn dance smash. Freshly spun by Annie Mac on Radio 1 as her ‘Hottest Record’ (2/9/15), the single was selected by MistaJam as his Inbox Fresh on 1Xtra, made Danny Howard's 'Future Anthem' and was played on Capital FM by Marvin and Max. Originally an instrumental (‘Rumble’) from elusive UK producer, KDA, the track got early support from Radio 1’s Annie Mac, Danny Howard, Pete Tong, Target, Monki, Toddla T (who liked it so much he made a remix for this year’s Notting Hill Carnival), Annie Nightingale, Nick Grimshaw, and Clara Amfo; to date it’s had over 50 plays on the station. Further support has come from Capital FM, 1Xtra, Kiss FM, Capital Xtra, and beyond. The track has hit No.1 on both of the world’s leading tastemaker charts (Buzz and Cool Cuts), and is already climbing rapidly up Shazam’s main and dance charts.